Cloud Microphones is a Tucson, AZ-based company specializing in handcrafted ribbon microphones made in an exacting fashion to meet — and in truth exceed, in many regards — the standards of quality set by Harry F. Olsen at RCA during the golden age of radio. Harry was the chief architect of RCA’s famed 44 and 77 microphones which are still coveted today. It is by no accident that Cloud Microphones’ founder, Stephen Sank, is the son of Jon Sank… whom RCA charged with updating and improving Mr. Olsen’s designs following his retirement. This quest culminated in the mighty BK11 which is arguably still considered a Holy Grail of studio ribbon microphones to this day. So, enough with the introductions! 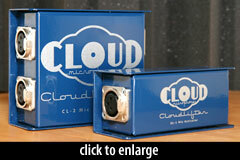 I must admit that whilst Stephen Sank’s continuation of his father’s legacy is exciting, the Cloud Microphones product that has intrigued me the most since its introduction is the CL-1 (single channel) and CL-2 (dual channel) Cloudlifter: a wee metal box intended to be placed in-line between a microphone and its preamp, which “gives passive microphone signals a major boost, up to +25db of ultra-clean gain, while properly loading the microphone’s transformer for transparent operation.” Being myself an owner of several ribbon microphones as well as the lovely but very low gain Shure SM7B, I have been long intrigued by the possibilities of increased performance promised by ribbon-specific preamps with higher, cleaner gain and increased impedances. But for those of us in the cheap seats, the spectre of purchasing a mic preamp in the $600+ (and +++) range to service just a small part of our mic collection was a bit daunting. So: an under-$150 street (for the single channel version) tool made by Stephen Sank himself which brings this same increased performance to ALL of my existing preamps? Heck yes! Bring it on! Thus I was absolutely thrilled when Matt offered me the opportunity to review the two-channel version of the Cloudlifter. I had to run back into the control room and turn the trim pots down. WAY down. My first use of the CL-2 was with a stereo pair of my beloved first-generation Shiny Box ribbon microphones on an acoustic guitar played by yours truly in a pickup session… replaying some parts by another guitar player from a session the week before. I had replaced the Shiny Box mic’s stock Chinese transformers with Lundahls several months earlier (as well as the ribbons themselves) and had already been enjoying greatly-improved clarity and boosted high end before the introduction of the CL-2. As I was “self-engineering” this session and running between control room and live room, I began by resetting my console’s trim pots where I thought they may need to be in order to handle the increased gain given by the Clouddlifter. Surprisingly I was not even close: these formerly-timid ribbons were now alarmingly loud and without a trace of added noise. I had to run back into the control room and turn the trim pots down. WAY down. The +25dB increase in gain touted by the Cloud Mics website was clearly no false boast. These mics were now more than adequately loud and without noise to record pick-strummed steel string acoustic guitar even without accompaniment to mask background noise. This, for me, was in and of itself reason enough to own a CL-2 as the un-hyped naturalness of tone that the ribbons imparted to the acoustic guitar… without that artificial condenser mic “zing” to the transients… was something I had been seeking for a long time. Further tests over the next week on sessions with other acoustic guitarists confirmed this and additionally revealed a great deal of clarity and openness that I believe may have something to do with the increased impedance magic as described on the Cloud Mics website. The CL-2 did not alter the inherent EQ of the mic per se, but it did seem to add more detail that could be attributed to increased sensitivity to transients coupled with a reduction in muffly low-mids… or perhaps just more detail and resolution in that range. The only acoustic guitar task that the Cloudlifter did NOT completely impress me with was in dealing with one performer (somewhat of a beginner) who played with her fingers at a rather ridiculously low volume, and was using strings so old they were spotted green with copper oxide. Here even the Cloudlifter was not enough to overcome the noise floor and I had to bring out the condensers. However, I cannot help but wonder if, had I used the CL-2 “properly” by placing it directly after the ribbon mic, would it have possibly given me a far cleaner boost down the 30 feet of balanced cable between the CL-2 and the control room? The Cloudlifter made it unnecessary for me to switch microphones for softer passages. My next CL-2 task was with a hard rock singer whose voice and volume level seemed a stellar fit for the Shure SM7B. This indeed proved true, however as has been the case with this mic in the past, often the exceedingly low output of this mic revealed its shortcomings in the form of hiss during softer passages where the guitars and drums were not present. Again the Cloudlifter handled the problem readily and made it unnecessary for me to switch microphones for softer passages. I cannot say that in this instance I noticed the same increase in clarity and detail as with the ribbon mics: one wonders if the special relationship between diaphragm, magnet, and transformer in ribbon mics pairs differently with the Cloudlifter than does the signal path of a moving coil mic. Then again, the clarity, detail, and openness of the SM7B has always been one of my favorite things about this mic with or without “help” so perhaps that which the Cloudlifter brings is simply less noticeable in such a scenario. My final trial with the CL-2 was back on the Shiny Box ribbons, this time used as room mics on a drum kit. This was in a hard rock context, and with a brutally loud drummer. Here was a scenario in which I had actually never really needed extra gain from my ribbons, so I was mostly just listening for an increase in the detail of the stereo kit image. It was definitely there, though once again not nearly as pronounced as with the acoustic guitars. This however was no doubt because of the specific way in which I go about room mic’ing a drum kit in a hard rock session: mics mere inches off the floor and avoiding the cymbals as much as possible. Set up to capture the low-end thump and thwack of kick and snare, and EQ’ed to accentuate this, such a scenario is not likely to show off some of the subtler attributes of the Cloudlifter which nonetheless make it such a valuable unit. My only real (though minor) complaint with the unit is a “tactical” one: seeing as how the proper use of the unit requires it to be placed directly after your microphone, this creates a couple of possible real-world usage issues. Firstly, you now have a box… with XLR cables in and out of it… sitting around in the middle of your studio floor. If you are like me, you not only find this lack of neatness irritating while running a session and trying to keep track of your cable runs, but one worries about the session players stepping on it and shearing off the XLR connectors. Placed at the “wrong” end of my cable run, connected to my breakout box with a set of 1' XLR patch cables, the CL-2 had been neatly out of the way. Secondly, placing the unit directly after the mic essentially requires by default that you increase your cable run’s length: assuming that you now have to get from the mic stand to the ground where the CL-2 sits, you’ve just required yourself to most likely add another 10' of mic cable to your run by way of the standard 10' cables most of us have lying around for general use… as opposed to the aforementioned 1' cables required to get from CL-2 to breakout box. Enough whining. All in all a truly wonderful tool for very little scratch, the CL-2 pays for itself many times over in its ability to allow greatly expanded use of your more finicky low-output mics without being shackled to a single specialized (and possibly expensive) preamp. 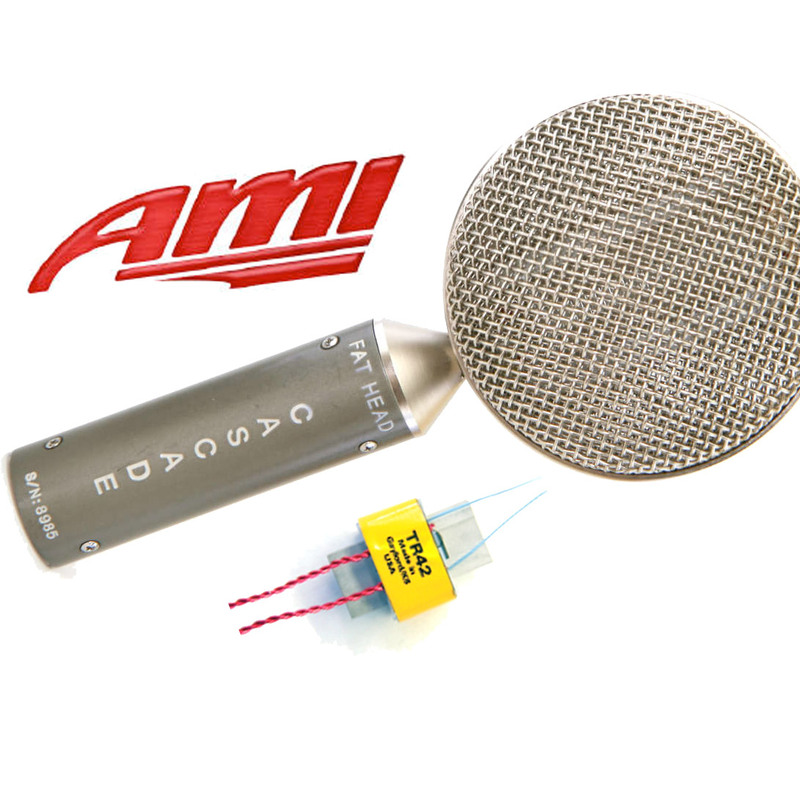 Which in turn ensures that you can pair your mics with whichever preamp “flavor” you prefer rather than settling for the single tonality of a ribbon-specific preamp. At $250 street for the two-channel version, I am keeping my test unit. 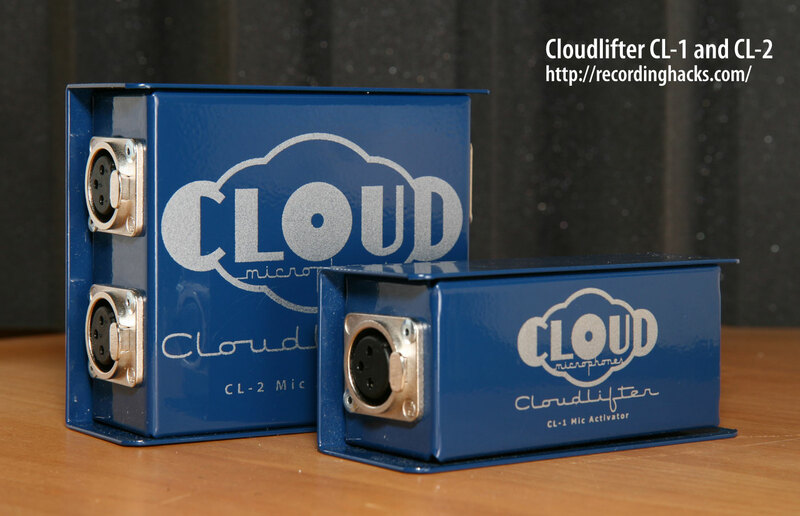 [See also my own CL-1 Review and the original Cloudlifter review for more tests and some comparison audio files. Adam Sullivan is a musician, engineer, and producer. He operates Great Magnet Recording on the rural edge of Santa Rosa, CA, providing a laid-back recording atmosphere for bands from all around Northern California. I guess this device works the same way as the TritonAudio Fethead does! (ref Ronan Chris Murphy’s review http://ow.ly/6ReY1 and one done by The HomeRecording SHow http://ow.ly/6Rf2u ) .. Wonder how they compare sonically and in practical use! The Fethead comes in a 3 basic of flavours. Standard, Filter with a bass roll off built in and Phantom that passes Phantom Power through – the first two don’t do that. The advantage of The Fethead is that it plugs right into the Microphones XLR socket and the Mic cable comes out the back of that so no boxes etc laying around to deal with and the device is as close to the Mic capsule as possible. I once use a Telefunken Ela M251, amazing microphone !!! Aw, really? You tested it wrong and still published the review? I mean, it’s impressive that it got great results for you, but you left us with several key questions unanswered. I look forward to reading a followup, one which includes your clever solution to both the “extra 10 feet of cable” and “extra box lying on the floor” problems (both of which seem eminently solvable). You know Jacque in truth the “I used it wrong” was more of a necessary caveat and you shouldn’t consider it the focus of the review. The misuse was so minor and the results so stunning I really didn’t feel the need for a time-consuming total do-over. That said, I take your point to heart and I would be enthused about a possible future shootout in the nature of a “Noisy Mics/Quiet Musician Cloudlifter Challenge!” where I get the CL-2 all snuggled up next to the noisy mic as close as can be and let ‘er rip. That would be a great review…I’ll try and make it happen! As for the “extra ten feet of cable problem” you are right: IF one is handy with a soldering iron (as I am) or happens to own a pre-purchased cable of considerably shorter length. I myself own many cables I’ve made myself of varying lengths not commonly available. However, this review is for everyone, so I felt it poor form to simply assume that everyone reading the review would have access to such a solution. Many folks out there will want to know how this product works in your garden variety “off-the-shelf” studio where everything is stock and commonly-available. Final note: regarding the ““extra box lying on the floor” issue, you’ll see in my review that both Matt and I already suggested strapping the CL-1 to a mic stand (and that Cloud actually offers a rig for this). XLR barrel connectors could also work. But the CL-2 has dual inputs for two separate mics or a stereo mic. I’m sure that you can see where this makes things a lot less easy to deal with. Thanks for your comments and keep reading! @Kiwicompooser, I covered the fethead in my original Cloudlifter review (see the link in the main story text). First of all, thanks to everyone at recordinghacks for the awesome reviews and information that help me keep my off-the-shelf studio full and my wallet…uhh…clean. The Cloudlifter is an amazing piece of equipment, for all of the reasons mentioned above, and especially for the way its added gain really eliminates the scourge of all “affordable” preamps (especially when coupled with similarly affordable ribbon mics- the static-y hiss that comes with high gain settings. I find myself using ribbons on a LOT more sources ever since purchasing the CL-2, which i did pursuant to reading Matthew McGlynn’s review. Additionally, when tracking in my 24′ x 24′ garage studio, I find myself using the first five inputs of my interface more frequently than all the others, often running different types of mics through the preamps which generally stay on their dedicated interface inputs. For someone with half a brain, this wouldn’t be a problem. But on more than one occasion, I have realized that I left the phantom power on when changing from condenser to ribbon, and the only thing preventing my precious modded ribbon(s) from being electrocuted was the mighty Cloudlifter. So yeah, this thing really pays for itself. I made (and continue to intentionally make) the same “mistake” that Adam confessed to above. For all practical purposes, the difference is indiscernible to me. Keep up the awesome writing, guys. Tony is referring of course to my propensity towards verbosity. He often calls me A10K, which is not a potentiometer value joke but in fact refers to the size of my (text only) emails (to him) in bytes. There are so many places I could go with “bump box” but I am taking the high road. Just assume there’s a joke about your mom in there somewhere. Christ, it’s as if I need to write a reply with A10K’s verbosity just to be considered worthy of of his precious time or something. I’m pretty sure he and Matt are in cahoots to just to keep me blathering on as I’m won’t to do. Sure wish reviews included pictures of the interior of devices such as this. While i understand that there are patent concerns, and the like, it isn’t a technical violation. Patent law allows for a one-time not-for-profit build of any patented device, anyway. But, for those, like myself, who know what they are looking at/for, an internal picture would communicate as much as an A10k email. For one, i’m curious as to the use of transformers, transistors, and/or opamps. The myriad of possible approaches all have a unique audio affectation. And, how hard is it, really, to pop the back off, and snap a picture? In my opinion, a review is incomplete without a picture of the internal build quality/circuit. 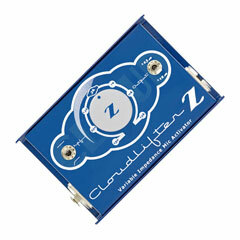 @Alexander, Rodger Cloud has stated elsewhere on this site that the Cloudlifter uses a JFET-based circuit without any capacitors or resistors in the signal path. And if you’ve read any of our reviews, you know the intent of the device is to provide clean, transparent (aka “unaffected”) gain — and further that the device succeeds in its intent admirably. The point of these reviews is to tell audio engineers about our experiences with the device, not to tell hobbyists to build one for themselves. That said I’m pretty sure there’s a hamster in there. Yes, I realize I am a few years late, in totally honesty, in more than a few event life supposed to do categories, and genres. Yes, you guessed it I am a musician… every that’s heard me says, dude you’re really good! Yea, I gave a few things away with that reveal, didn’t I. . . I responded to this because, Adam Sullivan’s comedic contributions are as good as any of the content I read commenced this read! Adam S. If you need a short break from the music, you should definitely have a go with your gifted comedic talents! Thanks, Adam S., for the laugh break afforded per your comedic genius! Shalom, shalom!